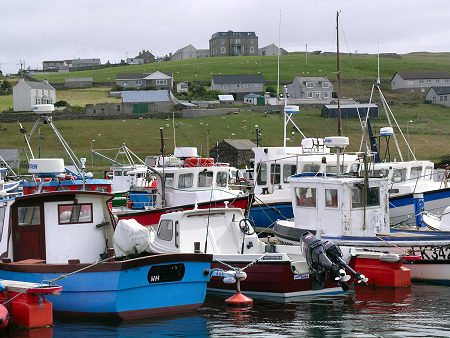 Whalsay lies off the east coast of Shetland's Mainland and is reached by a regular 30 minute ferry link to Laxo, a little east of Voe. The name comes from the Old Norse Whale Island, though for generations of Scottish fishermen it has been better known as The Bonny Isle. The island measures some five and a half miles from south west to north east, and some two miles wide. 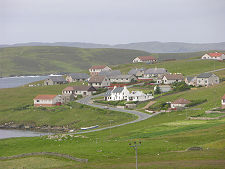 With a population that stood at 1,034 in 2001 and 1,061 in 2011, Whalsay is one of Shetland's more densely populated islands and, unusually for an island community, this population has increased fairly steadily over the past century and a half, from 628 in 1841. Those intending to visit Whalsay should be aware that this large population seems to support a very limited range of services of interest to visitors. 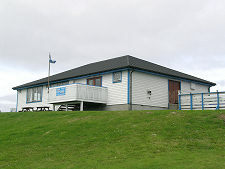 There is only one place for visitors to eat on Whalsay, the Oot Ower Lounge, and booking is essential for lunch or dinner. And while the island's one shop is extremely well stocked, on some days of the week you are likely to find a wider choice of peat digging implements than sandwiches. Yet the large amount of new and often attractive housing that has been built in recent years suggests an island with a very healthy economy. The answer to what seems a slight mystery lies in the sea. Literally. Whalsay has through history been known for the sailing abilities of its menfolk. This has had its drawbacks. It was far from unknown for Royal Navy ships of the Napoleonic era to intercept traditional fishing sixareens from Whalsay, open boats with six oarsmen to supplement the sail, and "press" the whole crew into service. As far as their families were concerned these men simply disappeared. And there were more natural dangers: a storm in 1832 claimed the lives of many Whalsay fishermen, as did another in 1840. All this against a background of boom and bust in the island's fishing industry. 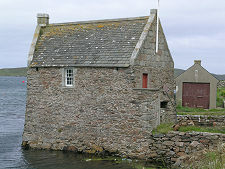 By the 1600s Whalsay's importance as a producer of fish resulted in the establishment of the Hanseatic trading booth, Pier House in Symbister's old harbour. From here dried and salted fish was traded with northern Europe. 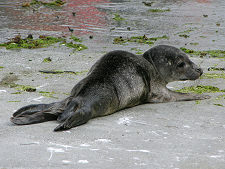 Two centuries later herring was the focus of activity. The peak year for herring catches was 1834, but these had declined dramatically within a few years. Fishing boomed again in the late 1800s and in the mid 1900s, but each time this was followed by decline. Whalsay today is a thriving community largely because of a relatively new fishing phenomenon, the pelagic trawler. These huge vessels are built for deep sea fishing, and keep their catches fresh over prolonged periods at sea. 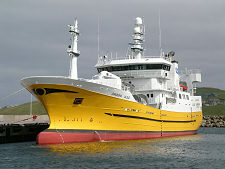 Shetland is home to a quarter of the UK's pelagic fleet, and within Shetland the centre of activity is on Whalsay. These vessels, amongst the largest fishing boats in Europe, can cost up to £15m each, yet the health of the industry can be seen in the recent replacement of a number of Shetland's pelagic trawlers. The Charisma, shown above right, is a good example. 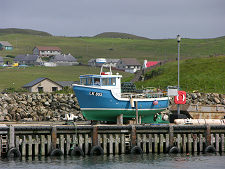 Meantime, though, Whalsay also remains home to many more traditional and much smaller fishing boats. It is possible that Whalsay residents focused on the sea because of problems on the land. 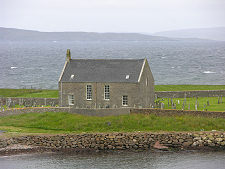 The island was largely a crofting community until acquired by the Bruce family in the 1600s. They then oppressed the island and its residents for the better part of three centuries. As late as the 1800s any islander crossing the Bruce family was exiled from Whalsay. 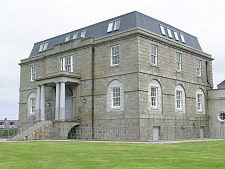 The decline of the Bruce dynasty was largely caused by the building 1823 of Symbister House, on top of the hill overlooking Symbister Harbour. This was built with stone quarried on Mainland and cost the truly enormous sum for the day of £30,000 (despite the use of forced labour) by the Sixth Robert Bruce of Symbister. It is said his aim was less to build somewhere to live than to ensure his heirs would not be able to inherit his fortune: and he succeeded. The last resident laird died in 1944 and since then the house has served as a school. 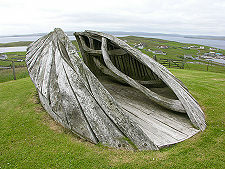 The grounds of Symbister House offer excellent views of Symbister, and are home to an attractive wooden boat sculpture. They are also home, apparently, to the ghost of an old sailor, murdered after he argued with Symbister House's gardener over a game of cards. 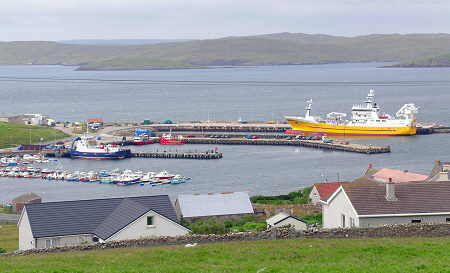 Visitors travelling to Whalsay by ferry arrive in Symbister Harbour, which remains the focus of island life and activity. Those arriving by air will find that the airstrip is at Skaw, near Whalsay's northern tip: which is also home to Whalsay Golf Club. This has the distinction of being the UK's most northerly golf club, and perhaps the only one that includes an airstrip amongst its hazards. 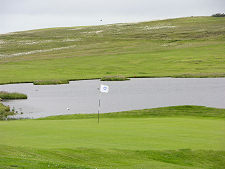 Whether Whalsay is also home to the UK's most northerly golf course is more debatable, as there is a small, unofficial, golf course at Burrafirth on Unst.